Musings 'n scribblings of a philanthrope .. : Frustration and inability to add value, the impact of Lean thinking.. Frustration and inability to add value, the impact of Lean thinking.. Simple and brilliant illustration of lean thinking.. Frustration is a state of mind when one is unable to add value to the tasks he/she is set to complete. 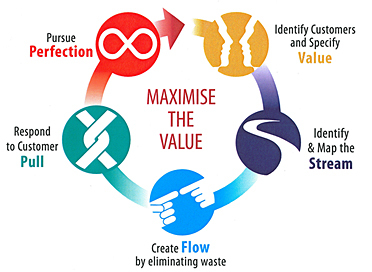 What are the factors impeding adding value to a process or product ? Though the discussion is focused mainly on manufacturing, all the concepts are equally applicable in the services context too. 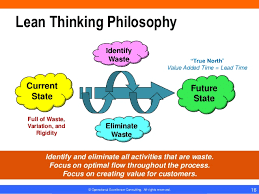 James P. Womack and Daniel T. Jones in 1996 propounded Lean Thinking as the absense of waste either in a product, process or technology. More often than not, waste creeps into almost all of our activities. Though Womack and Jones classified only seven wastes, an eighth waste that has been discussed and researched much is the waste of human capability, resources and skills in underemployment. An effort is made here to classify the prioritise the wastes for removal according to the impact it has on our society. When a customer is waiting for the delivery of a service, there is a waste of time. When client in a litigation has to endlessly wait for the court to deliver the verdict, there is waiting, which is a waste of time. When morning commuters wait at a busy traffic junction for the lights to turn green, again it is waiting, a waste of time as there is improper matching of demand, traffic and commuters to capacity, the limitation on vehicles that can pass through a lane and speed limitations to avoid accidents. An ambulance carrying a critically injured patient to hospital waiting at a traffic signal can be fatal for the patient. 2. Excess Transport - Producing a resource at one place and consuming it at another place, (in the case of manufacturing) or trying to get the provider of a service and it's consumer at the same place (as in service organisations), is what drives the necessity of transportation across the world. If the provision of a product or service and its consumption can be brought closer, it would totally eliminate the need for transportation. Transportation according to me is the second largest generator of waste in the world. The crux of the Lean Thinking process ..
3. Excess Inventory - inventory costs on an average almost 30% costs in a manufacturing environment and less in a service environment. Inventory can be kept in check by responding to demand almost every time. uncertainty in government policies and what not. 4. Under utilization of human resources - More often than not we find highly skilled and qualified people occupying less challenging roles in organisations across the world. The skills of the employee are being under utilized, though for a shorter period of time, as promotions and transfers to more challenging environments do take care of such anomalies. 5. Over processing - The next major source of waste is over processing, be it products or services. Be it patients entering a hospital, as a source of revenue, hospitals do over-process or over-treat a patient in the hope of generating revenues to the hospital, though actually it is generating waste. In the process of boiling milk, the pasteurisation process has taken care of 99% of microbes in the milk, still we boil it to kills the remaining 1% bacteria, though it may be an inefficient process. 6. Defects/Reworks - due to poor quality of machines and material, poor skills of workers or improperly maintained work or storage environment, we find lot of waste being generated across the world. Controlling these defects help save raw materials, machine time, worker time etc. We find the workers are more relaxed and focused on the necessary and urgent tasks to be completed. 7. Over production - Due to improper demand forecasts or bull whip effect (amplification of demand), we find production more often exceeding actual demand, generating waste and resulting in unsold stocks forcing disposal of stocks which could turn out to be very detrimental for the profitability of the supply chain. 8. Excess Motion - Needless repetition of a process results in waste of time, effort and costs. Machine intervention works well here, but involves additional costs. For example automation is a clean substitute for needless repetition of motion but entails great costs. The ideal thing would be to do simple work study of the process and eliminate unnecessary and all non-value adding tasks. Having identified the prioritised ranking of wastes, the study needs to look at finding the priority of wastes for different industrial sectors. Knowing the priorities for wastes it becomes easy for managers to decide where to concentrate their limited managerial and technical resources to extract the maximum benefit from deploying lean thinking in the shop floor. 1. May, Mathew, Its time to wage an all-out war on waste, HBR, December 2012. 2. Womack,Thomas, Daniel Jones (1996), Lean Thinking, Simon and Schuster, NY. PS : The wastes ranking has been done with inputs from an MBA student group with limited industrial exposure but excellent practical exposure.